Context. 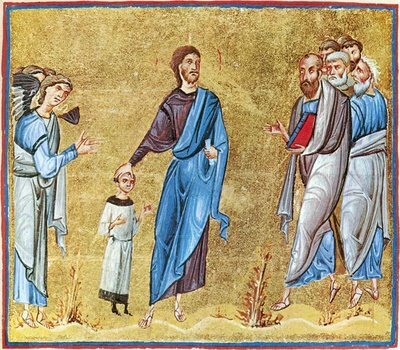 As we move further into the liturgical year, it should become evident that there are fewer demonstrations of power and teaching authority, although they will continue to occur, e.g., the healing of the boy with demon (Mark 9:19-29). The emphasis is ever on preparing his disciples for the time when Jesus will not be among them in an earthly form. The text for this Sunday is commonly referred to as Christ’s second passion/resurrection prediction. The Transfiguration (9:2-8) where Peter doesn’t know what to say and the three disciples are terrified. The discussion coming down the mountain (9:9-13) where the disciples fail to understand Jesus’ comment about “rising from the dead,” yet these disciples were with Jesus when he raised a twelve-year-old girl from the dead (5:35-43) and they had just come down from the mountain where the dead (Moses and Elijah) were alive. As Stoffregen notes, each of the passion (/resurrection) predictions in Mark follows the same pattern. This 2nd prediction alters several elements from the previous version. Instead of being rejected by the religious leaders, Jesus is to be handed over to “men.” The verb has shifted from the passive “be killed” (8:31) to the active “they will kill him” (9:31). The disciples’ response points to a deepening separation from Jesus. Earlier, Peter had protested the first passion prediction (8:31–33), and the group, who failed to understand the meaning of resurrection, discussed it and asked Jesus whether Elijah would indeed have to come first (9:10–11). Now they are afraid to ask Jesus about the word they do not understand (v. 32). Fear plays a prominent role in the passion narrative. Fear and silence conclude the whole Gospel when the women flee from the tomb (16:8). In any event, Jesus continues to teach (v. 31, imperfect verbs = continuous action in the past). The disciples continued to not understand (agnoeo) and continued to be afraid to ask him about his teachings (v. 32, imperfect verbs again). The other verb “to fear” (phobeomai) is used as the opposite of faith in 4:41; 5:36. It is also an emotion that the disciples frequently have: 4:41; 6:50; 10:32 (3rd passion prediction); 16:8. The three disciples are “terrified” (ekphobos — a related word) at the transfiguration (9:6). It seems discipleship is ever the ongoing process.